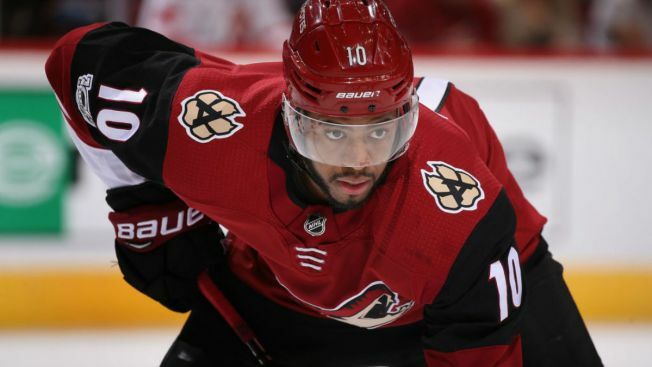 The Chicago Blackhawks are looking to get younger and faster, and they took a step toward that on Wednesday as they acquired Anthony Duclair in a trade with the Arizona Coyotes. The Blackhawks also acquired defenseman Adam Clendening in the swap. In exchange, forwards Richard Panik and Laurent Dapuhin are going to the Coyotes. Duclair, a former third round pick, has scored nine goals and dished out six assists for the Coyotes this season. He set a career high in goals during the 2015-16 season, with 20 goals in 81 games. Clendening, a second round pick of the Blackhawks in the 2011 NHL Draft, has bounced around the NHL during his brief career, and has two assists in five games with the Coyotes this season. Panik, who signed a two-year deal worth $2.8 million per season, will now head to the Coyotes after breaking a 27-game scoring drought with a goal against the Ottawa Senators on Tuesday night. Panik scored a career high 22 goals for the Blackhawks last season, but has struggled this year with just six goals in 37 games. The Blackhawks will next take the ice on Wednesday when they take on the Minnesota Wild at the United Center.